We can all agree that our kids can benefit from spending some quality time with us parents. This is why you have to engage in activities that you can do together. One of the best activities that you can do is cooking. It’s engaging, fun and interesting. As a bonus, it can help teach them how to be responsible. Speaking of being responsible, it’s your responsibility as an adult to ensure their safety. Cooking can be a dangerous activity especially for kids. You don’t have to worry though because it can be a very safe activity if you’re going to follow these safety tips. Ensure that there’s adult supervision all the time. Even as an adult, you know that all it takes is a second for you to get into a kitchen accident. This is why you have to make sure that you have eyes on the kids all the time while they’re in the kitchen. Make sure that you know what they’re doing and that you can see that they’re doing it right. The supervising adult will also ensure that the kids are following the rest of the safety tips in this article. As an additional note, make sure that you let the kids know that they need permission from an adult before they start working in the kitchen. This way, they’re not going to start working in the kitchen without an adult’s approval and guidance. Teach the kids the importance of washing their hands. This is very basic. Germs are all over the kitchen even if you clean it all the time. This shouldn’t discourage you from letting your kids work in the kitchen. You just should make sure that they wash their hands before, during and after working in the kitchen. If they resist, just tell them the germs that they’re touching and that if they want to eat food that have these germs in it. That should encourage them to wash their hands. You should also teach them about cross-contamination especially when dealing with raw chicken and food in general. Unless they’re old and skilled enough, don’t let them use knives by themselves. There are a lot of things that kids can do in the kitchen. Using knives, unless they’re old and skilled enough, should be left to an adult. The adults should do the slicing, cutting and chopping. To keep the kids engaged, you can let them watch. Of course, you should reiterate the importance of not playing with knives. You can teach your kids how to use knives safely. You can start them young. You can start by using those plastic knives that are used by restaurants for to-go orders. There are also plastic knives that are kid-friendly. Just make sure that you provide guidance. When they’re old and skilled enough, that’s when they can start using real knives. Of course, still with your guidance. There’s really no specific age when you can say that it’s safe for them to handle knives. You can’t say that they can handle knives when they’re 7, 8 or 15 years old. When they’re ready, they’re ready, and only you can tell. Of course, the more practice they have, the earlier they can be ready. See our lesson on knife safety here. Place pots and pans on top of the stove in such a way that the handle is facing away. This can help avoid accidents. If the handle is facing outwards towards you and the kids, you or the kids can easily bump into the handle and this can lead to a disaster. Kids may also be tempted to grab the handle. This is more of a tip for the adults. By cleaning as you go, you’ll lessen the chance of an accident in the kitchen. If you spilled liquid on the floor, clean it up immediately so that the kids won’t slip. By cleaning as you go, you will also make the kitchen more organized. This can lead to a safer kitchen. For example, by cleaning and storing the knives properly after use, you’ll lessen the chance of kids accidentally grabbing the sharp knives. Establish a rule wherein they should ask first before they taste something. Kids have this tendency to taste anything and everything. Untrained kids will lick anything off of their fingers or spoons that they’ve been using while prepping meals. You should establish and enforce a rule wherein they should ask you first if they want to lick or taste something. The last thing you’d want is for them to get salmonella. This one’s obvious. They shouldn’t play with fire and this includes the oven, stove, matches and the likes. Adults should be the ones to control the fire in the kitchen until they’re old enough to understand the. Not paying sufficient attention while cooking starts an unfortunate amount of fires in the home. Always use a pot holder. Things can get hot in the kitchen. 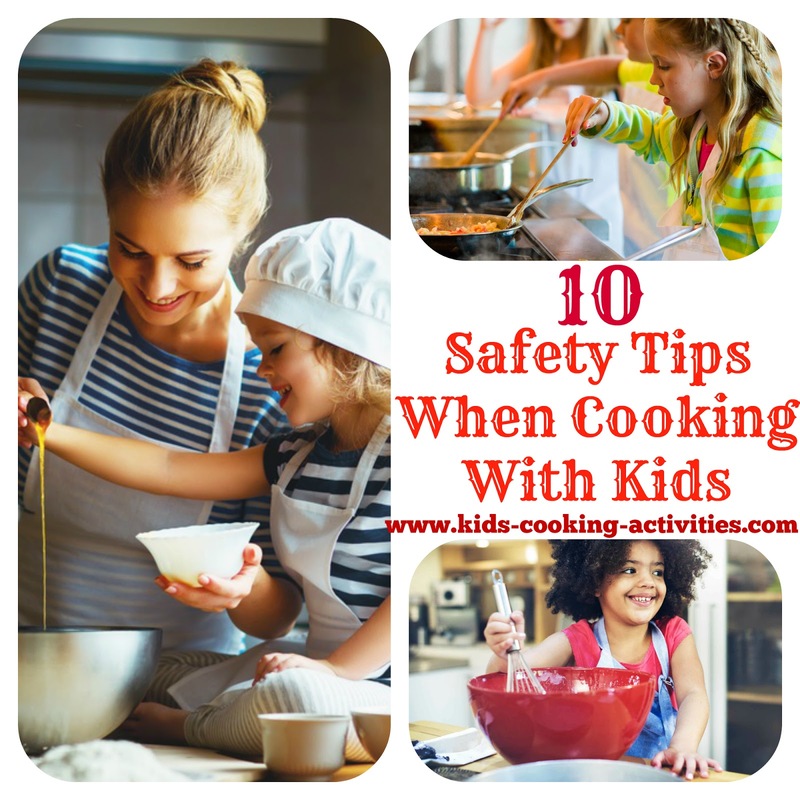 Ensure that kids always use a pot holder when handling hot pots and pans. In addition, enforce a rule wherein they should ask if they want to grab something. Educate them about the appliances. These appliances are electrical in nature so kids shouldn’t play with them. Teach them things like don’t touch the appliances when their hands are wet, keep the appliances away from water, and the likes. Tips on teaching kids to use appliances here. The kitchen should be a smartphone-free zone. You can’t afford to have a distracted kid just because he’s looking at his phone every 5 seconds in between cutting vegetables. Take out all distractions that also include the TV. Your kids will follow your lead. This means that you should also practice these safety tips in the kitchen. These safety tips when cooking with kids may not mean much to you as an experienced adult, but your kids may pick up bad habits that can jeopardize their safety. Set a good example and they will emulate it. More Kitchen Safety Help including a printable kitchen safety chart. In our Teacher's Curriculum Set we dive more into kitchen safety, food contamination and spreading germs.